For the historical region of Canada, see New Britain (Canada). "NSW" redirects here. For other uses, see NSW (disambiguation). New South Wales (abbreviated as NSW) is a state on the east coast of Australia. It borders Queensland to the north, Victoria to the south, and South Australia to the west. Its coast borders the Tasman Sea to the east. The Australian Capital Territory is an enclave within the state. New South Wales' state capital is Sydney, which is also Australia's most populous city. In September 2018[update], the population of New South Wales was over 8 million, making it Australia's most populous state. Just under two-thirds of the state's population, 5.1 million, live in the Greater Sydney area. Inhabitants of New South Wales are referred to as New South Welshmen. 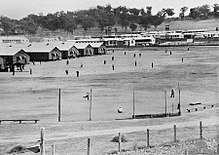 The Colony of New South Wales was founded as a penal colony in 1788. It originally comprised more than half of the Australian mainland with its western boundary set at 129th meridian east in 1825. The colony also included the island territories of New Zealand, Van Diemen's Land, Lord Howe Island, and Norfolk Island. During the 19th century, most of the colony's area was detached to form separate British colonies that eventually became New Zealand and the various states and territories of Australia. However, the Swan River Colony has never been administered as part of New South Wales. Lord Howe Island remains part of New South Wales, while Norfolk Island has become a federal territory, as have the areas now known as the Australian Capital Territory and the Jervis Bay Territory. The prior inhabitants of New South Wales were the Aboriginal tribes who arrived in Australia about 40,000 to 60,000 years ago. Before European settlement there were an estimated 250,000 Aboriginal people in the region. The Wodi Wodi people are the original custodians of the Illawarra region of South Sydney. Speaking a variant of the Dharawal language, the Wodi Wodi people lived across a large stretch of land which was roughly surrounded by what is now known as Campbelltown, Shoalhaven River and Moss Vale. The Bundjalung people are the original custodians of parts of the northern coastal areas. The European discovery of New South Wales was made by Captain James Cook during his 1770 survey along the unmapped eastern coast of the Dutch-named continent of New Holland, now Australia. In his original journal(s) covering the survey, in triplicate to satisfy Admiralty Orders, Cook first named the land "New Wales", named after Wales. However, in the copy held by the Admiralty, he "revised the wording" to "New South Wales". The first British settlement was made by what is known in Australian history as the First Fleet; this was led by Captain Arthur Phillip, who assumed the role of governor of the settlement on arrival in 1788 until 1792. After years of chaos and anarchy after the overthrow of Governor William Bligh, a new governor, Lieutenant-Colonel (later Major-General) Lachlan Macquarie, was sent from Britain to reform the settlement in 1809. During his time as governor, Macquarie commissioned the construction of roads, wharves, churches and public buildings, sent explorers out from Sydney and employed a planner to design the street layout of Sydney. Macquarie's legacy is still evident today. During the 19th century, large areas were successively separated to form the British colonies of Tasmania (proclaimed as a separate colony named Van Diemen's Land in 1825), South Australia (1836), Victoria (1851) and Queensland (1859). Responsible government was granted to the New South Wales colony in 1855. Following the Treaty of Waitangi, William Hobson declared British sovereignty over New Zealand in 1840. In 1841 it was separated from the Colony of New South Wales to form the new Colony of New Zealand. Charles Darwin visited Australia in January 1836 and in The Voyage of the Beagle (chapter 19 of the 11th edition) records his hesitations about and fascination with New South Wales, including his speculations about the geological origin and formation of the great valleys, the aboriginal population, the situation of the convicts, and the future prospects of the country. At the end of the 19th century, the movement toward federation between the Australian colonies gathered momentum. Conventions and forums involving colony leaders were held on a regular basis. Proponents of New South Wales as a free trade state were in dispute with the other leading colony Victoria, which had a protectionist economy. At this time customs posts were common on borders, even on the Murray River. Travelling from New South Wales to Victoria in those days was very difficult. Supporters of federation included the New South Wales premier Sir Henry Parkes whose 1889 Tenterfield Speech (given in Tenterfield) was pivotal in gathering support for New South Wales involvement. Edmund Barton, later to become Australia's first Prime Minister, was another strong advocate for federation and a meeting held in Corowa in 1893 drafted an initial constitution. In 1898 popular referenda on the proposed federation were held in New South Wales, Victoria, South Australia and Tasmania. All votes resulted in a majority in favour, but the New South Wales government under Premier George Reid (popularly known as "yes–no Reid" because of his constant changes of opinion on the issue) had set a requirement for a higher "yes" vote than just a simple majority which was not met. In 1899 further referenda were held in the same states as well as Queensland (but not Western Australia). All resulted in yes votes with majorities increased from the previous year. New South Wales met the conditions its government had set for a yes vote. As a compromise to the question on where the capital was to be located, an agreement was made that the site was to be within New South Wales but not closer than 100 miles (161 km) from Sydney, while the provisional capital would be Melbourne. Eventually the area that now forms the Australian Capital Territory was ceded by New South Wales when Canberra was selected. In the years after World War I, the high prices enjoyed during the war fell with the resumption of international trade. Farmers became increasingly discontented with the fixed prices paid by the compulsory marketing authorities set up as a wartime measure by the Hughes government. In 1919 the farmers formed the Country Party, led at national level by Earle Page, a doctor from Grafton, and at state level by Michael Bruxner, a small farmer from Tenterfield. The Great Depression, which began in 1929, ushered in a period of political and class conflict in New South Wales. The mass unemployment and collapse of commodity prices brought ruin to both city workers and to farmers. The beneficiary of the resultant discontent was not the Communist Party, which remained small and weak, but Jack Lang's Labor populism. Lang's second government was elected in November 1930 on a policy of repudiating New South Wales' debt to British bondholders and using the money instead to help the unemployed through public works. This was denounced as illegal by conservatives, and also by James Scullin's federal Labor government. The result was that Lang's supporters in the federal Caucus brought down Scullin's government, causing a second bitter split in the Labor Party. In May 1932 the Governor, Sir Philip Game dismissed his government. The subsequent election was won by the conservative opposition. By the outbreak of World War II in 1939, the differences between New South Wales and the other states that had emerged in the 19th century had faded as a result of federation and economic development behind a wall of protective tariffs. New South Wales continued to outstrip Victoria as the centre of industry, and increasingly of finance and trade as well. Labor returned to office under the moderate leadership of William McKell in 1941 and remained in power for 24 years. World War II saw another surge in industrial development to meet the needs of a war economy, and also the elimination of unemployment. Labor stayed in power until 1965. Towards the end of its term in power, it announced a plan for the construction of an opera/arts facility on Bennelong Point. The design competition was won by Jørn Utzon. Controversy over the cost of the Sydney Opera House became a political issue and was a factor in the eventual defeat of Labor in 1965 by the conservative Liberal Party led by Sir Robert Askin. Sir Robert remains a controversial figure with supporters claiming him to be reformist especially in terms of reshaping the NSW economy. Others though, regard the Askin era as synonymous with corruption with Askin the head of a network involving NSW police and SP bookmaking (Goot). In the late 1960s a secessionist movement in the New England region of the state led to a referendum on the issue. The new state would have consisted of much of northern NSW including Newcastle. The referendum was narrowly defeated and, as of 2010[update], there are no active or organised campaigns for new states in NSW. Askin's resignation in 1975 was followed by a number of short lived premierships by Liberal Party leaders. When a general election came in 1976 the ALP under Neville Wran were returned to power. Wran was able to transform this narrow one seat victory into landslide wins (known as Wranslide) in 1978 and 1981. After winning a comfortable though reduced majority in 1984, Wran resigned as premier and left parliament. His replacement Barrie Unsworth struggled to emerge from Wran's shadow and lost a 1988 election against a resurgent Liberal Party led by Nick Greiner. Unsworth was replaced as ALP leader by Bob Carr. Initially Greiner was a popular leader instigating reform such as the creation of the Independent Commission Against Corruption (ICAC). Greiner called a snap election in 1991 which the Liberals were expected to win. However the ALP polled extremely well and the Liberals lost their majority and needed the support of independents to retain power. Greiner was accused (by ICAC) of corrupt actions involving an allegation that a government position was offered to tempt an independent (who had defected from the Liberals) to resign his seat so that the Liberal party could regain it and shore up its numbers. Greiner resigned but was later cleared of corruption. His replacement as Liberal leader and Premier was John Fahey whose government secured Sydney the right to host the 2000 Summer Olympics. In the 1995 election, Fahey's government lost narrowly and the ALP under Bob Carr returned to power. Like Wran before him Carr was able to turn a narrow majority into landslide wins at the next two elections (1999 and 2003). During this era, NSW hosted the 2000 Sydney Olympics which were internationally regarded as very successful, and helped boost Carr's popularity. Carr surprised most people by resigning from office in 2005. He was replaced by Morris Iemma, who remained Premier after being re-elected in the March 2007 state election, until he was replaced by Nathan Rees in September 2008. Rees was subsequently replaced by Kristina Keneally in December 2009. Keneally's government was defeated at the 2011 state election and Barry O'Farrell became Premier on 28 March. On 17 April 2014 O'Farrell stood down as Premier after misleading an ICAC investigation concerning a gift of a bottle of wine. The Liberal Party then elected Treasurer Mike Baird as party leader and Premier. Baird resigned as Premier on 23 January 2017, and was replaced by Gladys Berejiklian. Executive authority is vested in the Governor of New South Wales, who represents and is appointed by Elizabeth II, Queen of Australia. The current Governor is David Hurley. The Governor commissions as Premier the leader of the parliamentary political party that can command a simple majority of votes in the Legislative Assembly. The Premier then recommends the appointment of other Members of the two Houses to the Ministry, under the principle of responsible or Westminster government. As in other Westminster systems, there is no constitutional requirement in NSW for the Government to be formed from the Parliament—merely convention. The Premier is Gladys Berejiklian of the Liberal Party. The form of the Government of New South Wales is prescribed in its Constitution, dating from 1856 and currently the Constitution Act 1902 (NSW). Since 1901 New South Wales has been a state of the Commonwealth of Australia, and the Australian Constitution regulates its relationship with the Commonwealth. In 2006, the Constitution Amendment Pledge of Loyalty Act 2006 No 6, was enacted to amend the NSW Constitution Act 1902 to require Members of the New South Wales Parliament and its Ministers to take a pledge of loyalty to Australia and to the people of New South Wales instead of swearing allegiance to Elizabeth II her heirs and successors, and to revise the oaths taken by Executive Councillors. The Pledge of Loyalty Act was officially assented to by the Queen on 3 April 2006. Under the Australian Constitution, New South Wales ceded certain legislative and judicial powers to the Commonwealth, but retained independence in all other areas. The New South Wales Constitution says: "The Legislature shall, subject to the provisions of the Commonwealth of Australia Constitution Act, have power to make laws for the peace, welfare, and good government of New South Wales in all cases whatsoever". The first "responsible" self-government of New South Wales was formed on 6 June 1856 with Sir Stuart Alexander Donaldson appointed by Governor Sir William Denison as its first Colonial Secretary which in those days accounted also as the Premier. The State Parliament is composed of the Sovereign and two houses: the Legislative Assembly (lower house), and the Legislative Council (upper house). Elections are held every four years on the fourth Saturday of March, the most recent being on 23 March 2019. At each election one member is elected to the Legislative Assembly from each of 93 electoral districts and half of the 42 members of the Legislative Council are elected by a statewide electorate. New South Wales is divided into 128 local government areas. There is also the Unincorporated Far West Region which is not part of any local government area, in the sparsely inhabited Far West, and Lord Howe Island, which is also unincorporated but self-governed by the Lord Howe Island Board. New South Wales is policed by the New South Wales Police Force, a statutory authority. Established in 1862, the NSW Police Force investigates Summary and Indictable offences throughout the State of New South Wales. The state has two fire services: the volunteer based New South Wales Rural Fire Service, which is responsible for the majority of the state, and the Fire and Rescue NSW, a government agency responsible for protecting urban areas. There is some overlap due to suburbanisation. Ambulance services are provided through the Ambulance Service of New South Wales. Rescue services (i.e. vertical, road crash, confinement) are a joint effort by all emergency services, with Ambulance Rescue, Police Rescue Squad and Fire Rescue Units contributing. Volunteer rescue organisations include the Australian Volunteer Coast Guard, State Emergency Service (SES), Surf Life Saving New South Wales and Volunteer Rescue Association (VRA). The estimated population of New South Wales at the end of September 2018 was 8,023,700 people, representing approximately 31.96% of nationwide population. In June 2017 Sydney was home to almost two-thirds (65.3%) of the NSW population. The Sydney central business district is Australia's largest financial centre. 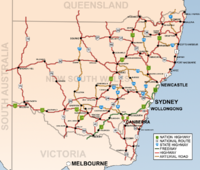 Passage through New South Wales is vital for cross-continent transport. Rail and road traffic from Brisbane (Queensland) to Perth (Western Australia), or to Melbourne (Victoria) must pass through New South Wales. The majority of railways in New South Wales are currently operated by the state government. Some lines began as branch-lines of railways starting in other states. For instance, Balranald near the Victorian border was connected by a rail line coming up from Victoria and into New South Wales. Another line beginning in Adelaide crossed over the border and stopped at Broken Hill. Railways management are conducted by Sydney Trains and NSW TrainLink which maintain rolling stock. Sydney Trains operates trains within Sydney while NSW TrainLink operates outside Sydney, intercity, country and interstate services. Both Sydney Trains and NSW TrainLink have their main terminus at Sydney's Central station. NSW TrainLink regional and long-distance services consist of XPT services to Grafton, Casino, Brisbane, Melbourne and Dubbo, as well as Xplorer services to Canberra, Griffith, Broken Hill, Armidale and Moree. NSW TrainLink intercity trains operate on the Blue Mountains Line, Central Cost & Newcastle Line, South Coast Line, Southern Highlands Line and Hunter Line. 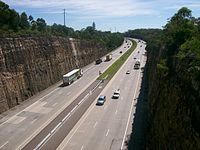 Major roads are the concern of both federal and state governments. The latter maintains these through the Department of Roads and Maritime Services, formerly the Roads and Traffic Authority, and before that, the Department of Main Roads (DMR). Great Western Highway linking Sydney with Bathurst. As Route 32 it continues west as the Mitchell Highway then as the Barrier Highway to Adelaide via Broken Hill. Other roads are usually the concern of the RMS and/or the local government authority. Kingsford Smith Airport (commonly Sydney Airport, and locally referred to as Mascot Airport or just 'Mascot'), located in the southern Sydney suburb of Mascot is the major airport for not just the state but the whole nation. It is a hub for Australia's national airline Qantas. Virgin Australia (formerly known as Virgin Blue Airlines). Harbour City Ferries operates ferries within Sydney Harbour and the Parramatta River, while Newcastle Transport has a ferry service within Newcastle. All other ferry services are privately operated. Spirit of Tasmania ran a commercial ferry service between Sydney and Devonport, Tasmania. This service was terminated in 2006. Private boat services operated between South Australia, Victoria and New South Wales along the Murray and Darling Rivers but these only exist now as the occasional tourist paddle-wheeler service. The Sydney Grammar School, established in 1854, is the oldest secondary school still in use in the Sydney CBD. The NSW school system comprises a kindergarten to year 12 system with primary schooling up to year 6 and secondary schooling between years 7 and 12. Schooling is compulsory from before 6 years old until the age of 17 (unless Year 10 is completed earlier). Between 1990 and 2010, schooling was only compulsory in NSW until age 15. Primary and secondary schools include government and non-government schools. Government schools are further classified as comprehensive and selective schools. Non-government schools include Catholic schools, other denominational schools, and non-denominational independent schools. Typically, a primary school provides education from kindergarten level to year 6. A secondary school, usually called a "high school", provides education from years 7 to 12. Secondary colleges are secondary schools which only cater for years 11 and 12. The NSW Education Standards Authority classifies the 13 years of primary and secondary schooling into six stages, beginning with Early Stage 1 (Kindergarten) and ending with Stage 6 (years 11 and 12). A Record of School Achievement (RoSA) is awarded by the NSW Education Standards Authority to students who have completed at least Year 10 but leave school without completing the Higher School Certificate. The RoSA was introduced in 2012 to replace the former School Certificate. The Higher School Certificate (HSC) is the usual Year 12 leaving certificate in NSW. Most students complete the HSC prior to entering the workforce or going on to study at university or TAFE (although the HSC itself can be completed at TAFE). The HSC must be completed for a student to get an Australian Tertiary Admission Rank (formerly Universities Admission Index), which determines the student's rank against fellow students who completed the Higher School Certificate. Eleven universities primarily operate in New South Wales. Sydney is home to Australia's first university, the University of Sydney founded in 1850. Other universities include the University of New South Wales, Macquarie University, the University of Technology, Sydney and Western Sydney University. The Australian Catholic University has two of its six campuses in Sydney, and the private University of Notre Dame Australia also operates a secondary campus in the city. Outside Sydney, the leading universities are the University of Newcastle and the University of Wollongong. Armidale is home to the University of New England, and Charles Sturt University and Southern Cross University have campuses spread across cities in the state's south-west and north coast respectively. The public universities are state government agencies, however they are largely regulated by the federal government, which also administers their public funding. Admission to NSW universities is arranged together with universities in the Australian Capital Territory by another government agency, the Universities Admission Centre. Primarily vocational training is provided up the level of advanced diplomas is provided by the state government's ten Technical and Further Education (TAFE) institutes. These institutes run courses in more than130 campuses throughout the state. New South Wales is bordered on the north by Queensland, on the west by South Australia, on the south by Victoria and on the east by the Tasman Sea. The Australian Capital Territory and the Jervis Bay Territory form a separately administered entity that is bordered entirely by New South Wales. The state can be divided geographically into four areas. New South Wales' three largest cities, Sydney, Newcastle and Wollongong, lie near the centre of a narrow coastal strip extending from cool temperate areas on the far south coast to subtropical areas near the Queensland border. The Illawarra region is centred on the city of Wollongong, with the Shoalhaven, Eurobodalla and the Sapphire Coast to the south. The Central Coast lies between Sydney and Newcastle, with the Mid North Coast and Northern Rivers regions reaching northwards to the Queensland border. Tourism is important to the economies of coastal towns such as Coffs Harbour, Lismore, Nowra and Port Macquarie, but the region also produces seafood, beef, dairy, fruit, sugar cane and timber. The Great Dividing Range extends from Victoria in the south through New South Wales to Queensland, parallel to the narrow coastal plain. This area includes the Snowy Mountains, the Northern, Central and Southern Tablelands, the Southern Highlands and the South West Slopes. Whilst not particularly steep, many peaks of the range rise above 1,000 metres (3,281 ft), with the highest Mount Kosciuszko at 2,229 m (7,313 ft). Skiing in Australia began in this region at Kiandra around 1861. The relatively short ski season underwrites the tourist industry in the Snowy Mountains. Agriculture, particularly the wool industry, is important throughout the highlands. Major centres include Armidale, Bathurst, Bowral, Goulburn, Inverell, Orange, Queanbeyan and Tamworth. There are numerous forests in New South Wales, with such tree species as Red Gum Eucalyptus and Crow Ash (Flindersia australis), being represented. Forest floors have a diverse set of understory shrubs and fungi. One of the widespread fungi is Witch's Butter (Tremella mesenterica). The western slopes and plains fill a significant portion of the state's area and have a much sparser population than areas nearer the coast. Agriculture is central to the economy of the western slopes, particularly the Riverina region and Murrumbidgee Irrigation Area in the state's south-west. Regional cities such as Albury, Dubbo, Griffith and Wagga Wagga and towns such as Deniliquin, Leeton and Parkes exist primarily to service these agricultural regions. The western slopes descend slowly to the western plains that comprise almost two-thirds of the state and are largely arid or semi-arid. The mining town of Broken Hill is the largest centre in this area. One possible definition of the centre for New South Wales is located 33 kilometres (21 mi) west-north-west of Tottenham. The major part of New South Wales, west of the Great Dividing Range, has an arid to semi arid climate. Rainfall averages from 150 to 500 millimetres (5.9 to 19.7 in) a year throughout most of this region. Summer temperatures can be very hot, while winter nights can be quite cold in this region. Rainfall varies throughout the state. The far north-west receives the least, less than 180 mm (7 in) annually, while the east receives between 700 to 1,400 mm (28 to 55 in) of rain. The climate along the flat, coastal plain east of the range varies from oceanic in the south to humid subtropical in the northern half of the state, right above Wollongong. Rainfall is highest in this area; however, it still varies from around 800 millimetres (31 in) to as high as 3,000 millimetres (120 in) in the wettest areas, for example Dorrigo. Along the southern coast, rainfall is heaviest in winter due to cold fronts which move across southern Australia, while in the far north, around Lismore, rain is heaviest in summer from tropical systems and occasionally even cyclones. The climate in the southern half of the state is generally warm to hot in summer and cool in the winter. 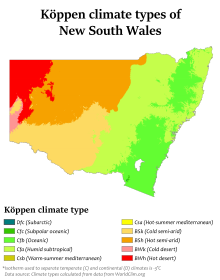 The seasons are more defined in the southern half of the state, especially as one moves inland towards South West Slopes, Central West and the Riverina region. The climate in the northeast region of the state, or the North Coast, bordering Queensland, is hot and humid in the summer and mild in winter. The Northern Tablelands, which are also on the north coast, have relatively mild summers and cold winters, due to their high elevation on the Great Dividing Range. Peaks along the Great Dividing Range vary from 500 metres (1,640 ft) to over 2,000 metres (6,562 ft) above sea level. Temperatures can be cool to cold in winter with frequent frosts and snowfall, and are rarely hot in summer due to the elevation. Lithgow has a climate typical of the range, as do the regional cities of Orange, Cooma, Oberon and Armidale. Such places fall within the subtropical highland (Cwb) variety. Rainfall is moderate in this area, ranging from 600 to 800 mm (24 to 31 in). Snowfall is common in the higher parts of the range, sometimes occurring as far north as the Queensland border. On the highest peaks of the Snowy Mountains, the climate can be subpolar oceanic and even alpine on the higher peaks with very cold temperatures and heavy snow. The Blue Mountains, Southern Tablelands and Central Tablelands, which are situated on the Great Dividing Range, have mild to warm summers and cold winters, although not as severe as those in the Snowy Mountains. The highest maximum temperature recorded was 49.7 °C (121 °F) at Menindee in the west of the state on 10 January 1939. The lowest minimum temperature was −23 °C (−9 °F) at Charlotte Pass in the Snowy Mountains on 29 June 1994. This is also the lowest temperature recorded in the whole of Australia excluding the Antarctic Territory. The Sydney Harbour Bridge is an important tourist attraction for New South Wales and a globally recognised image of Australia itself. Port Kembla is notable for its steelworks industry, with many ships utilising the port. Since the 1970s, New South Wales has undergone an increasingly rapid economic and social transformation. Old industries such as steel and shipbuilding have largely disappeared; although agriculture remains important, its share of the state's income is smaller than ever before. New industries such as information technology and financial services are largely centred in Sydney and have risen to take their place, with many companies having their Australian headquarters in Sydney CBD. In addition, the Macquarie Park area of Sydney has attracted the Australian headquarters of many information technology firms. Coal and related products are the state's biggest export. Its value to the state's economy is over A$5 billion, accounting for about 19% of all exports from NSW. Tourism has also become important, with Sydney as its centre, also stimulating growth on the North Coast, around Coffs Harbour and Byron Bay. Tourism is worth over $25.1 billion to the New South Wales economy and employs 7.1% of the workforce. In 2007, then-Premier of New South Wales Morris Iemma established Events New South Wales to "market Sydney and NSW as a leading global events destination". In July 2011 Events NSW merged with three key state authorities including Tourism NSW to establish Destination NSW (DNSW). New South Wales had a Gross State Product in 2010–11 (equivalent to Gross Domestic Product) of $419.9 billion which equalled $57,828 per capita. On 9 October 2007 NSW announced plans to build a 1,000 MW bank of wind powered turbines. The output of these is anticipated to be able to power up to 400,000 homes. The cost of this project will be $1.8 billion for 500 turbines. On 28 August 2008 the New South Wales cabinet voted to privatise electricity retail, causing 1,500 electrical workers to strike after a large anti-privatisation campaign. The NSW business community is represented by the NSW Business Chamber which has 30,000 members. Agriculture is spread throughout the eastern two-thirds of New South Wales. Cattle, sheep and pigs are the predominant types of livestock produced in NSW and they have been present since their importation during the earliest days of European settlement. Economically the state is the most important state in Australia, with about one-third of the country's sheep, one-fifth of its cattle, and one-third of its small number of pigs. New South Wales produces a large share of Australia's hay, fruit, legumes, lucerne, maize, nuts, wool, wheat, oats, oilseeds (about 51%), poultry, rice (about 99%), vegetables, fishing including oyster farming, and forestry including wood chips. Bananas and sugar are grown chiefly in the Clarence, Richmond and Tweed River areas. Wools are produced on the Northern Tablelands as well as prime lambs and beef cattle. The cotton industry is centred in the Namoi Valley in northwestern New South Wales. On the central slopes there are many orchards, with the principal fruits grown being apples, cherries and pears. About 40,200 hectares of vineyards lie across the eastern region of the state, with excellent wines produced in the Hunter Valley, with the Riverina being the largest wine producer in New South Wales. Australia's largest and most valuable Thoroughbred horse breeding area is centred on Scone in the Hunter Valley. The Hunter Valley is the home of the world-famous Coolmore, Darley and Kia-Ora Thoroughbred horse studs. About half of Australia's timber production is in New South Wales. Large areas of the state are now being replanted with eucalyptus forests. The Hunter Valley is known for its vineyards and wineries. Under the Water Management Act 2000, updated riparian water rights were given to those within NSW with livestock. This change was named "The Domestic Stock Right" which gives "an owner or occupier of a landholding is entitled to take water from a river, estuary or lake which fronts their land or from an aquifer which is underlying their land for domestic consumption and stock watering without the need for an access licence." New South Wales has more than 780 national parks and reserves covering more than 8% of the state. These parks range from rainforests, waterfalls, rugged bush to marine wonderlands and outback deserts, including World Heritage sites. The Royal National Park on the southern outskirts of Sydney became Australia's first National Park when proclaimed on 26 April 1879. Originally named The National Park until 1955, this park was the second National Park to be established in the world after Yellowstone National Park in the U.S. Kosciuszko National Park is the largest park in state encompassing New South Wales' alpine region. The National Parks Association was formed in 1957 to create a system of national parks all over New South Wales which led to the formation of the National Parks and Wildlife Service in 1967. This government agency is responsible for developing and maintaining the parks and reserve system, and conserving natural and cultural heritage, in the state of New South Wales. These parks preserve special habitats, plants and wildlife, such as the Wollemi National Park where the Wollemi Pine grows and areas sacred to Australian Aboriginals such as Mutawintji National Park in western New South Wales. Throughout Australian history, New South Wales sporting teams have been very successful in both winning domestic competitions and providing players to the Australian national teams. The largest sporting competition in the state is the National Rugby League, which is based in Sydney and expanded from the New South Wales Rugby League. The state is represented by the New South Wales Blues in the State of Origin series. Sydney is the spiritual home of Australian rugby league and hosts nine of the 16 NRL teams: Canterbury-Bankstown Bulldogs, Cronulla Sharks, Manly Sea Eagles, Parramatta Eels, Penrith Panthers, South Sydney Rabbitohs, Sydney Roosters and Wests Tigers, as well as being the northern home of the St George Illawarra Dragons, which is based in Wollongong. A tenth team, the Newcastle Knights is located in Newcastle. The state is represented by four teams in soccer's A-League: Sydney FC (2005–06, 2009–10, 2016–17 champions), Western Sydney Wanderers (2014 Asian champions), Central Coast Mariners (2012–13 champions) and Newcastle United Jets (2007–08 A League Champions). Australian rules football has historically not been strong in New South Wales outside the Riverina region. However, the Sydney Swans relocated from South Melbourne in 1982 and their presence and success since the late 1990s has raised the profile of Australian rules football, especially after their AFL premiership in 2005. A second NSW AFL club, the Greater Western Sydney Giants, entered the competition in 2012. The main summer sport is cricket and the Sydney Cricket Ground hosts the 'New Year' cricket Test match in January each year. The NSW Blues play in the One-Day Cup and Sheffield Shield competitions. Sydney Sixers and Sydney Thunder both play in the Big Bash League. Other teams in major national competitions include the Sydney Kings and Illawarra Hawks in the National Basketball League, Sydney Uni Flames in the Women's National Basketball League, NSW Waratahs in Super Rugby and New South Wales Swifts in Suncorp Super Netball. Sydney was the host of the 2000 Summer Olympics and the 1938 British Empire Games. The Olympic Stadium, now known as ANZ Stadium hosts major events including the NRL Grand Final, State of Origin, rugby union and football internationals. It hosted the final of the 2003 Rugby World Cup and the 2015 AFC Asian Cup, as well as the 2006 FIFA World Cup qualifier between Australia and Uruguay, qualifying Australia for their first World Cup since 1974. The annual Sydney to Hobart Yacht Race begins in Sydney Harbour on Boxing Day. Bathurst hosts the annual Bathurst 1000 as part of the Supercars Championship at Mount Panorama Circuit. The popular equine sports of campdrafting and polocrosse were developed in New South Wales and competitions are now held across Australia. Polocrosse is now played in many overseas countries. The Big Golden Guitar in Tamworth represents the city's country music culture. As Australia's most populous state, New South Wales is home to a number of cultural institutions of importance to the nation. In music, New South Wales is home to the Sydney Symphony Orchestra, Australia's busiest and largest orchestra. Australia's largest opera company, Opera Australia, is headquartered in Sydney. Both of these organisations perform a subscription series at the Sydney Opera House. Other major musical bodies include the Australian Chamber Orchestra. Sydney is host to the Australian Ballet for its Sydney season (the ballet is headquartered in Melbourne). Apart from the Sydney Opera House, major musical performance venues include the City Recital Hall and the Sydney Town Hall. New South Wales is home to several major museums and art galleries, including the Australian Museum, the Powerhouse Museum, the Museum of Sydney, the Art Gallery of New South Wales and the Museum of Contemporary Art. Sydney is home to five Arts teaching organisations, which have all produced world-famous students: The National Art School, The College of Fine Arts, the National Institute of Dramatic Art (NIDA), the Australian Film, Television & Radio School and the Conservatorium of Music (now part of the University of Sydney). New South Wales is the setting and shooting location of many Australian films, including Mad Max 2, which was shot near the mining town of Broken Hill. The state has also attracted international productions, both as a setting, such as in Mission: Impossible 2, and as a stand-in for other locations, as seen in The Matrix franchise, The Great Gatsby and Unbroken. 20th Century Fox operates Fox Studios Australia in Sydney. Screen NSW, which controls the state film industry, generates approximately $100 million into the New South Wales economy each year. ^ a b "The origin of the term 'cockroach'". Australian Broadcasting Corporation. 13 June 2012. Retrieved 29 January 2013. ^ a b Jopson, Debra (23 May 2012). "Origin of the species: what a state we're in". The Sydney Morning Herald. Retrieved 29 January 2013. ^ "5220.0 – Australian National Accounts: State Accounts, 2017–18". Australian Bureau of Statistics. 16 November 2018. Retrieved 19 April 2019. ^ "Floral Emblem of New South Wales". www.anbg.gov.auhi. Retrieved 23 January 2013. ^ "New South Wales". Parliament@Work. Retrieved 22 January 2013. ^ "New South Wales". Geographical Names Register (GNR) of NSW. Geographical Names Board of New South Wales. Retrieved 9 December 2013. ^ "NSW State Flag & Emblems". NSW Government. Archived from the original on 18 September 2015. Retrieved 5 October 2015. ^ "Aboriginal settlement". About NSW. Archived from the original on 22 September 2013. Retrieved 21 September 2013. ^ a b History of Aboriginal People of the Illawarra 1770 to 1970. Department of Environment and Conservation, NSW. 2005. p. 8. ^ See Captain W. J. L. Wharton's preface to his 1893 transcription of Cook's journal. Available online in the University of Adelaide Library's Electronic Texts Collection. ^ Fletcher, B. H. (1967). Phillip, Arthur (1738–1814). Australian Dictionary of Biography. Melbourne University Press. pp. 326–333. ^ McLachlan, N. D. (1967). Macquarie, Lachlan (1762–1824). Australian Dictionary of Biography. Melbourne University Press. pp. 187–95. ^ Benson, Simon; Hildebrand, Joe (5 September 2008). "Nathan Rees new NSW premier after Morris Iemma quits". Courier Mail. Retrieved 13 January 2010. ^ a b "Keneally sworn in as state's first female premier". Herald Sun. Australia. 4 December 2009. Retrieved 4 December 2009. ^ "Constitution Act 1902". NSW Government. Retrieved 30 December 2013. ^ Constitution Act 1902 (NSW), section 5. ^ Australian Bureau of Statistics (27 June 2017). "New South Wales (State)". 2016 Census QuickStats. Retrieved 4 May 2018. ^ a b "3218.0 – Regional Population Growth, Australia, 2013–14". Australian Bureau of Statistics. 31 March 2015. ^ "Transport for New South Wales". Transport for New South Wales. Retrieved 10 July 2013. ^ "Virgin Australia". Virgin Australia. Retrieved 28 October 2011. ^ "Stockton Ferry". Newcastlebuses.info. 26 August 2011. Retrieved 28 October 2011. ^ "List of Ferry Services". Transportnsw.info. Archived from the original on 16 August 2016. ^ "Spirit of Tasmania – Sydney Service". Spiritoftasmania.com.au. Archived from the original on 19 October 2011. Retrieved 28 October 2011. ^ "EDUCATION ACT 1990 – SECT 21B Compulsory school-age". www.austlii.edu.au. Retrieved 23 November 2017. ^ "Not so fast: minimum leaving age raised". www.abc.net.au. Retrieved 23 November 2017. ^ "STAGES". www.abc.net.au. Retrieved 23 November 2017. ^ "Schooling in NSW". educationstandards.nsw.edu.au. Retrieved 23 November 2017. ^ "EDUCATION ACT 1990 – SECT 94 Record of School Achievement". www.austlii.edu.au. Retrieved 23 November 2017. ^ Joseph Henry Maiden. 1908. The Forest Flora of New South Wales, v. 3, Australian Government Printing Office. ^ C. Michael Hogan, Witch's Butter: Tremella mesenterica, GlobalTwitcher.com, ed; N. Stromberg Archived 21 September 2012 at the Wayback Machine. ^ Australian Encyclopaedia, Vol. 7, Grolier Society. ^ "Geoscience Australia – Center of Australia, States and Territories". Archived from the original on 22 August 2008. ^ a b c "Stormy Weather" (PDF). Bureau of Meteorology. Retrieved 16 May 2014. ^ "Rainfall and Temperature Records: National" (PDF). Bureau of Meteorology. Retrieved 14 November 2009. ^ "Official records for Australia in January". Daily Extremes. Bureau of Meteorology. 31 July 2013. Retrieved 12 March 2014. ^ "About Us". Destination NSW. 11 October 2011. Retrieved 17 July 2016. ^ "Australian National Accounts: State Accounts, 2010–11". Australian Bureau of Statistics. Retrieved 16 February 2012. ^ Australia to get 1,000 megawatt wind farm. ^ Agricultural Production Retrieved on 7 March 2009. ^ Agriculture – Overview – Australia Archived 21 May 2013 at the Wayback Machine. ^ "From paddock to plate". Tourism New South Wales. New South Wales Government. 1 July 2003. Archived from the original on 3 February 2009. Retrieved 7 March 2009. ^ SMH Travel – Scone. Retrieved on 7 March 2009. ^ "Domestic and stock rights". NSW Department of Primary Industries, Office of Water. 15 August 2014. Retrieved 9 April 2015. ^ 2008 Guide to National Parks, p. 59, NSW NPWS. ^ "Chisholm, Alec H.". The Australian Encyclopaedia. 6. Sydney: Halstead Press. 1963. p. 249. "National Parks". ^ "Who We Are". National Parks Association of NSW. Archived from the original on 4 August 2007. Retrieved 1 March 2009. ^ Frater, Patrick (30 September 2013). "Angelina Jolie's 'Unbroken' Set to Shoot in Oz". Variety. Retrieved 3 October 2013. ^ Clifford, Catherine (14 December 2013). "Hollywood actor Angelina Jolie starts filming scenes for the movie 'Unbroken' in Werris Creek". ABC News. Retrieved 15 December 2013. ^ "Screen NSW Annual Report (2012–13)" (PDF). screen.nsw.gov.au. Retrieved 31 August 2015. ^ "Building international relationships". NSW Government. Archived from the original on 14 November 2017. Retrieved 14 November 2017. ^ "International exchange activated with globalization". Ehime Prefecture. Archived from the original on 30 September 2018. Retrieved 1 November 2018. Wikimedia Commons has media related to New South Wales. Wikivoyage has a travel guide for New South Wales. This page was last edited on 19 April 2019, at 01:33 (UTC).